A former Marine Corps officer writes in a very thoughtful NPR column on EA's new Medal of Honor that he doesn't like the game's depiction of the ongoing war in Afghanistan but acknowledges that no nation should have the right to "govern fiction." EA's Medal of Honor was released today in North America and presumably that means that we can finally stop reading about what other people think of it and start formulating our own opinions instead. But this excellent NPR essay on the game by former Marine Corps officer and Iraq War veteran Benjamin Busch, in which he points out some obvious but occasionally forgotten truths about the difference between videogames and war, is well worth a read before we move on to other things. "I honestly don't like that Medal of Honor depicts the war in Afghanistan right now, because - even as fiction - it equates the war with the leisure of games. Changing the name of the enemy doesn't change who it is," he wrote. "But what nation or military has the right to govern fiction? Banning the representation of an enemy is imposing nationalism on entertainment. 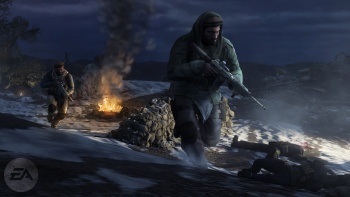 The game cannot train its players to be actual skilled special operations soldiers, nor is it likely to lure anyone into Islamic fundamentalism. It can grant neither heroism nor martyrdom. What it does do is make modern war into participatory cinema." "But imagine how frustrating this game would be if, just as you began to play it, an invisible sniper shot you dead every time," he continued. "The game would not be popular, because being killed that way isn't fair - just like war. Reality has a way of correcting misconceptions." Busch described Medal of Honor, and war games in general, as "sedentary adventurism in need of a subject," and had a rather grim message for anyone who sees more than that in it. "The truth is that there are two ways out of Afghanistan: wounds or luck. Proficiency is only part of surviving the randomness of death, and playing games will not protect or endanger soldiers or governments," he wrote. "Gamers inspired to join the Taliban, should talk to John Walker Lindh first. And for those who truly want to play for a Medal of Honor, recruiters are standing by. Only eight have been awarded since we invaded Afghanistan. All but one have been posthumous." Medal of Honor was released today for the PC, PlayStation 3 and Xbox 360.